These revolutionary fishing chairs come with four different back positions and two totally adjustable front legs. Reclines and also fits to any sloping shoreline or sneven Ground – fishing made more comfortable! Lean back while you cast a line – and have the best fishing chair on the lake. This chair breaks the mold with its comfortable seat and back padding, sleek exterior look, andslope adjustable extending legs. The Ultimate Portable Fishing Chair is designed to provide maximum long term comfort, even for extended periods of fishing or for those long days of simple outdoor relaxation. Carry this chair anywhere and feel assured that it will remain sturdy even on the most uneven of shorelines. 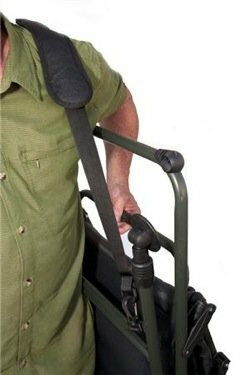 Adjustable front legs adapt to shoreline slope or any uneven sitting, laid back star gazing, and everything in between. Comfort is not compromised with this portable fishing chair. It is a fully padded fishing chair with a fishing rod holder: carrying it around is a breeze due to its ultra lightweight, sleek design and shoulder strap. When it comes to fishing chairs, these chairs are premium grade. The chairs are specially made to support healthy back & body posture, and their careful padding provides hours of added neck and back support. While this Ultimate 4 Position Portable Fishing Chair with Rod Holder has quickly become the top favorite with anglers, it also works perfectly for any outdoor gatherings, concert or events. Our fishing folding chair combines rugged durability with light, versatile design. Fishing chairs will never be the same. Take it anywhere and sit all day in total comfort! Designed for maximum comfort at the shoreline, the Ultimate Outdoor Adjustable Fishing Chair from Earth Products has a fully padded seat and backrest–that also reclines with four relaxed positions. Built for stability on uneven ground, the chair features front legs with four inches of height adjustability for leveling and swivel “mud” feet so that you don’t sink into sand or other soft ground. The chair comes equipped with a fishing pole holder and two drink holders so that you can set your line and enjoy a beverage. The chair folds flat into a highly portable package and is easy to carry thanks to an integrated shoulder strap. The chair’s padded shoulder strap makes it highly portable and comfortable to carry.